Introduction: Morbid obesity is a major healthcare problem in the United States. Morbid obesity affects military dependents and retirees as well. Laparoscopic bariatric surgery has been performed at Wright Patterson Medical Center (WPMC) for two years. 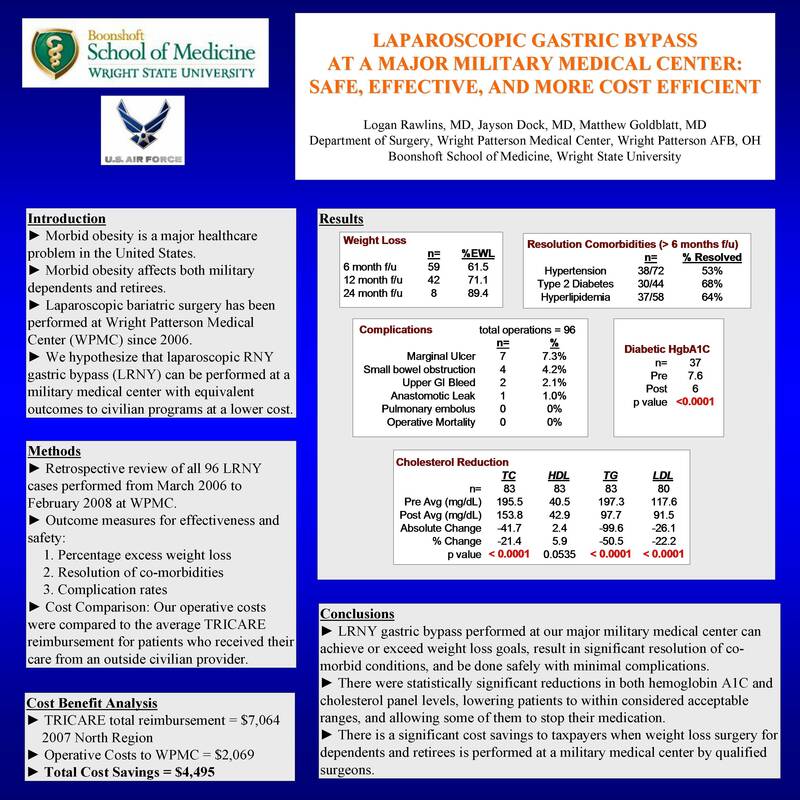 We hypothesize that laparoscopic RNY gastric bypass (LRNY) can be performed at a military medical center with equivalent outcomes to civilian programs at a lower cost. Methods: We reviewed all 96 LRNY cases performed from March 2006 to February 2008 at WPMC. We specifically examined excess weight loss at each postoperative visit, resolution of co-morbidities six months after surgery (hypertension, diabetes mellitus, hyperlipidemia), and complications (operative mortality, pulmonary embolus (PE), leak rate, upper gastrointestinal bleed (UGIB), small bowel obstruction (SBO)). Our operative costs were compared to average TRICARE reimbursement for patients sent to an outside civilian provider when a surgeon was unavailable within our region.